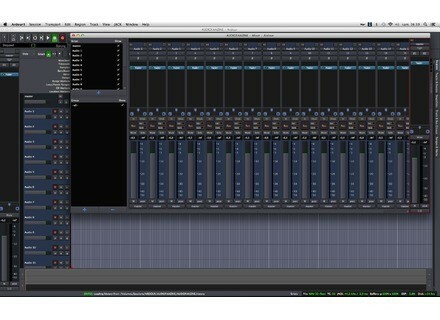 Ardour 3, General Sequencer from Ardour. 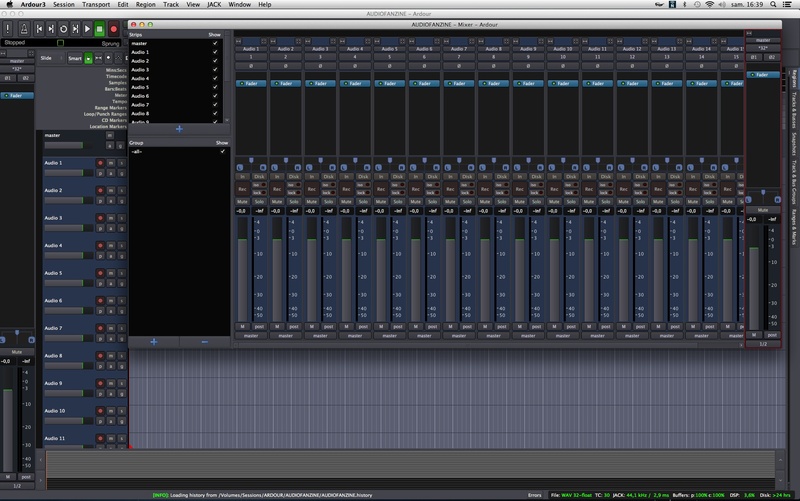 The Ardour team has announced the release of Ardour 3.0 Beta 1. This is the first version of Ardour 3 that has support for OS X (Intel only for now, not for PPC users), where you will find functional AudioUnit instrument support among all the other goodies that Ardour 3 brings. The list below documents the other changes, including support for Linux native VSTs, an initial new version of Freesound browsing, some new buttons, and various bug fixes and improvements. Give route groups their own colors. Allow route groups to color their tracks. Add option to insert time on all a track's playlists. Option to glue new markers to bars and beats. Implement invert selection for MIDI notes. Add Selection-by-note-range for MIDI notes. Add session option "MIDI-region-copy-is-fork". If set, all MIDI region copies will be independent from each other; settable via Session->Properties->Misc. Offer explicit monitoring choices, so that tracks can be forced to monitor their inputs (and more). Auto-connect new track/bus inputs to physical ports is now the default. Auto-connect new track/bus outputs to the master bus is now the default. Experimental, incomplete reimplementation of Freesound browser (part of the import dialog), allowing users to find and use audio from the vast Freesound audio database. Add option to have track/bus selection linked between the editor and mixer windows. On OS X, switch all use of Control and Alt/Option keys (closer to Apple's standard modifier usage). New ArdourButton widget, now widely used for buttons that convey state through their visual appearance. Rearrange the transport bar; items not frequently modified while working (auto-input, time-master) have been moved to Session->Properties or Edit->Preferences. Use evenly distributed green palette for MIDI notes. Use standard selection colour (purple) for selected MIDI notes. Less day-glo panner colours based on audio track colours. Make meters with different colour parameters actually work. Fix meter colour gradients (mid and top were swapped). Fix meter colour range to again have a hard knee at 0dB and twiddle colours so >0dB levels are red and stand out. Fix style of the clock in the insert time dialogue. Increase threshold for zoom-by-horizontal movement; ignore movements to y positions outside the scroomer; round page size and value to prevent 'quivering' during drags. Put session-modified asterix in mixer window title as well as editor. Redesigned info bar (ideas from Chris Goddard). Reorganize Preferences dialog a bit. Add Visibility control for a growing number of repeated GUI elements (particularly in mixer strips). Restore mixer strip comments button, but optionally visible. Don't show busses tab in MIDI connection managers, since there are no MIDI busses yet. Clean up display of channel buttons in monitor section so that it looks optimal for both normal people and ambisonics freaks. Add options to add ports to input/output menus on mixer strips. Add an option to disable editor update during drags of the summary pane (helps GUI performance with large sessions). Add option to set default-session-parent-dir. Don't offer up Send editors for internal sends (too confusing, because they are not like JACK-level sends). Add tooltips for plugins/inserts/sends in the mixer strip. Drastic overhaul of keyboard handling in mixer window. Fix port matrix dimensions on non-24-bit displays. Make "OK/Apply" the default response in several dialogs. Set window icons for the startup window. Provide global prelight option (its in Edit -> Preferences->Interface). Alert the user if a connection is made which causes feedback, and preserve the route graph in the state that it was in before the feedback was introduced. The intent being to simplify the code, reduce the number of areas of code which must consider feedback, and fix a few bugs. Provide global prelight option (see Edit -> Preferences->Interface). 2 level structure for theme manager window, to help with themeing ArdourButtons. Fix transparency of selection rectangles (and change color a bit). Add "active" indicator/control to rows in the editor route list. Fix insertion of processors at the point at which the processor menu was opened; give a visual cue to indicate where a processor will be inserted. make return/enter trigger the default action in a variety of dialogs. Fix crash caused by empty bundles. Fix a crash with plugins when the processing of a block of audio is split up (e.g. for automation handling). Fix crash on rename region. Fix crash when moving end marker after deleting loop range. Fix crash on "Consolidate Range" on MIDI tracks. Fix note snapping so that we snap to the note we're over. Fix various MIDI keybindings that were lost previously in a regression. Setup fader for audio/MIDI when its position in the processing chain is altered. Reconfigure processing chain appropriately when setting up a peak meter. Update fader curves when xfade length changes. Fix thinko bug with dragging one of the >1 tabs in the same route group. Stop session range location being removed on clear-ranges. Do not move the initial tempo / meter changes at 0 time when inserting time. Snap new automation points in AutomationRegionViews. Don't create new regions on clicks on MIDI plugin automation tracks. Set up ControlUI::combo_map correctly to fix drop-down boxes in generated plugin UIs (#4221). Based on work by jeremybub. Delete RouteUI immediately on request, rather than in an idle loop. Don't allow non-movable meter / tempo markers to be dragged. Don't draw MIDI note horizontal grid lines if they would be less than 3 pixels apart. Load the tempo map before the locations so that locations can compute their BBT positions correctly. Clear clicks on locating for a seamless loop so that they don't stop. Fix default disk_io_chunk_frames for diskstream so that it isn't larger than the default playback buffer size. Make it possible for undo records to contain details for crossfades that are later deleted. Fix adding of automation points to regions with a non-zero start. Check inodes before reporting ambiguous files (to avoid seeing symlinks twice). Fix interaction with JACK latency API. Handle scroll events on track header meters. Hide/ignore inputs on a plugin if the previous processing element doesn't provide any data for them. Make management of MIDI ports thread-safe. Various fixes to Mackie/Logic Control support. Fix a search/replace bug in TOC/CUE generation. Fix problems with selecting control points in AutomationRegionViews with non-zero region start. fix ghost note position on non-zero-start regions. Remove erroneous check that would prevent notes being put at pitch 0 or 127. Clear selected MIDI notes in all regions when they are cleared in a single one. Stop MIDIRegionView claiming PrimaryModifier-scrollwheel so that zoom still works when MIDI notes are selected. Make phone-home option default to False even for non-debug builds. Fix visibility of MIDI CC automation lanes. New Emu Xboard 61 binding map from mcgruff. Patch from colinf to disallow colons in snapshot names for compatibility with FAT filesystems. Adjust send faders depending on what signal type they are passing. Improve plugin hide logic to prevent crashes when trying to insert fully audio plugins into MIDI tracks. Save marker selection state in instant.xml. More robust plugin I/O mapping. Cope with drags of selections that include regions on hidden tracks. Fix check on dragging MIDI notes to a point before the region position. Fix snap of note drags when the region position is not itself snapped to the grid. Allow status bar components to be individually shown / hidden. Don't offer the monitor buss to export from. Don't resort routes at every step during a session's construction; can dramatically speed up loading of big sessions. Use shared_ptr for Port in the AudioEngine; improves thread-safety of the audio engine's port list as a writer cannot destroy a port in one thread while the port list is being iterated in another. Reload meters in the right place even if they are set to a custom position. Fix left-over Panner and related objects after session close. Change internal API used by native VST support to read/write info files, so that users can generate.fsi files in ~/.fst if is not writeable by them. Fix compensation of roll delay with MIDI tracks; data should be obtained from playback_sample, not transport_frame. Reverse the order of vertical tabs when they are on the right hand side so that from top to bottom it is the same order as that from left to right for the top tabs. Fix bleed of signals between tracks/busses caused by disabled plugins. Allocate some thread-local buffers for the GUI thread so that the Plugin analysis stuff works again. Make it impossible to create MIDI tape tracks. Do a topological sort of the route list before passing it to the graph, as the graph's feedback detection algorithm depends on the input route list being sorted in such a way. Fix naming / numbering of new MIDI tracks. Attempt to fix some confusions caused by bundles containing different types of ports. Fix master bus mute button. Use home-grown solution for path_expand(), rather than wordexp() which is broken in different ways on different platforms. Fix nasty off by one error that lead to the creation of 1 sample xfades where there should be none. Fix incorrect buffer status reports when using MIDI tracks. Open route group dialogue on Ctrl-right-click rather than Ctrl-left-click on a group tab to be more consistent with the rest of Ardour. Save custom meter position so that it can be restored if the metering point is set to something else and then back to custom again. Don't build tranzport support unless it was asked for (it doesn't work anyway). Remove LV2 support via SLV2 (Lilv only now). Comment out soundtouch-related configuration checks. Updated Italian translation from Raffaele Morelli. Updated Russian translation from Alexandre Prokoudine. New Norwegian translation from Eivind Ødegård. BBE SonicMax Pro for iOS BBE has announced that SonicMax, BBE's HD audio technology, is now available for the mobile generation with the release of SonicMax Pro for iOS. Soundiron Twine Bass + Special Sale Soundiron has released its new Twine Bass library, featuring a pair of oddities: a modified cello and a traditional Kenyan fretless stringed instrument called a Bolon. You can also get at least 33% Off nearly everything in their store from now until midnight on 11/29/11 (PST). Longcat Audio H3D 2.1.0 Longcat Audio Technologies has announced today that the H3D 2.1.0 packages now included the Avid Audio extension (AAX-Native) plugin format, which Avid introduced in Pro Tools 10.